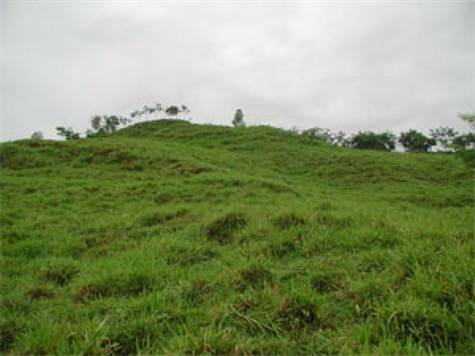 "Viento Lindo Sheep Farm" - 75 acres of jungle, streams, pastures--Working Sheep and ere Farm! Gorgeous ocean, mountain, river and waterfall views with 6 building locations. Working sheep and reforestation farm! If you are looking for a small farm where you can have your own sheep, horses, and cattle, and where you can view the monkeys in your own reforestation trees, this is the farm for you! It is in a great location, with 3 streams and waterfalls. Truly an "in the country" feeling, yet easily accessible to both Dominical and San Isidro del General. One section has been replanted with rare indigenous trees for timber, as well as avocado and other native fruit trees. The working sheep farm is maintained by local workers and there is huge demand for lamb in the area. This business can easily be developed into a profitable venture with a full-time owner. The property boasts at least 6 building areas easily accessible from the road. The 25-acre parcel located within the original "mother farm", but not contiguous with the 50-acre sheep/reforestation farm, has a 1/2 acre hilltop lot with 360 degree mountain/valley and seasonal waterfall views. The San Juan de Dios Valley is considered a jewell of rural land, located just inland from the Las Lagunas luxury home estates and the Punta Mira estates. The area is a mix of Gringo and Costa Rican neighbors who help one another as needed. "Little John" & his wife Lianne maintain a riverfront permaculture farm and live across from the farm Other neighbors include Lucy & Ruben who built their own 6,000 sf home themselves, and enjoy their grad piano in the living room. There are many kind-hearted and helpful Tico neighbors nearby. The educational non-profit, Tropical Forestry Initiative, is just down the road in the village of Tres Piedras. Their year-round staff support reforestation, sustainable living practices and education of college students who are studying tropical ecology. Connections to electricity are right along the road. The farm is connected to the local aqueduct water system.